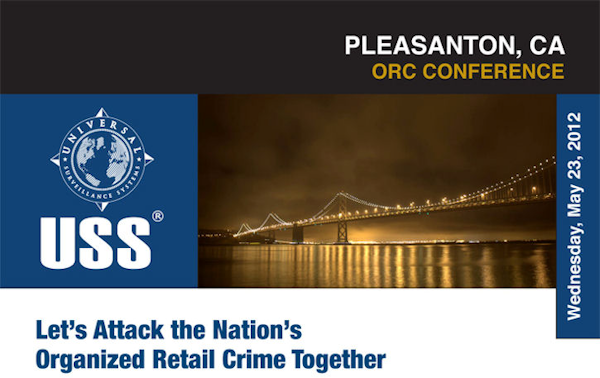 A collaborative environment filled with ORC specialists joined together in Pleasanton, CA for a Regional Organized Retail Crime Conference sponsored by Universal Surveillance Systems (USS) and Safeway on May 23, 2012. 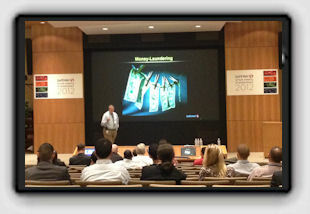 Several knowledgeable speakers presented valuable information at this one-day conference. Three speakers from Safeway kicked off the conference with discussions on ORC Case Studies and Trends in Northern California ORC. Bob James, Corporate LP Manager/ORC Coordinator, Safeway Inc. gave an overview about the ORC program at Safeway. He talked about high-theft goods such as alcohol and cigarettes being sold for resale and the importance of protecting those assets. Safeway ORC Investigators Joe Cowles and Brad Gardiner then discussed the internal side of ORC, including the challenges facing the food and drug industry. Cowles discussed a new problem facing the ORC industry in California: AB 109, signed into effect by Governor Brown last year. AB 109 gives offenders early release for non-violent crimes, which equals a risk for retailers battling organized retail crime. A Special Agent with the U.S. Department of Homeland Security spoke next and covered money laundering and drug trafficking. The agent discussed working with retail and other law enforcement departments to decrease some of the international problems facing ORC. The agent also went over the ongoing trend in ORC: baby formula theft, which has become a major issue for retailers. Nelson Harrah, Director of ORC for the Gap, followed Angert with a case study review and discussed the importance of working partnerships with other retailers. The next speaker, ORC Consultant Ron Koziol, gave a related talk about building good relationships with loss prevention personnel and law enforcement agencies for collaborative purposes. The afternoon session began with Bill Suthard, CFI, Senior Corporate Investigator, Barnes and Noble, who spoke about solutions for ORC and Internet fencing investigations. Lauren Cunningham, Senior Investigator for eBay Global Asset Protection, talked about partnerships within the retail community and building a foundation for future commerce. Lastly, Rod Holm, Vice President of Global Sales at Universal Surveillance Systems discussed the ways his company has utilized ORC technology to help retailers combat theft. USS sponsors four ORC conferences in different parts of the county throughout the year where experts in the field offer proven solutions in combating ORC. There is no charge to attend. Contact USS at 1-800-488-9097 or go to www.retailorc.org for more information.